Take a walking tour of the huge market in Aix-en-Provence. The Grande Marche, also known as big market day, in Provence is a festive event. Join in on the festivities like a local. Take a guided tour of all five parts of the market, with a special focus on the produce sections and the specialty food vendors. You’ll learn how locals shop, special local ingredients and the regional dishes made with them. Meet and talk with the local vendors and sample their products. 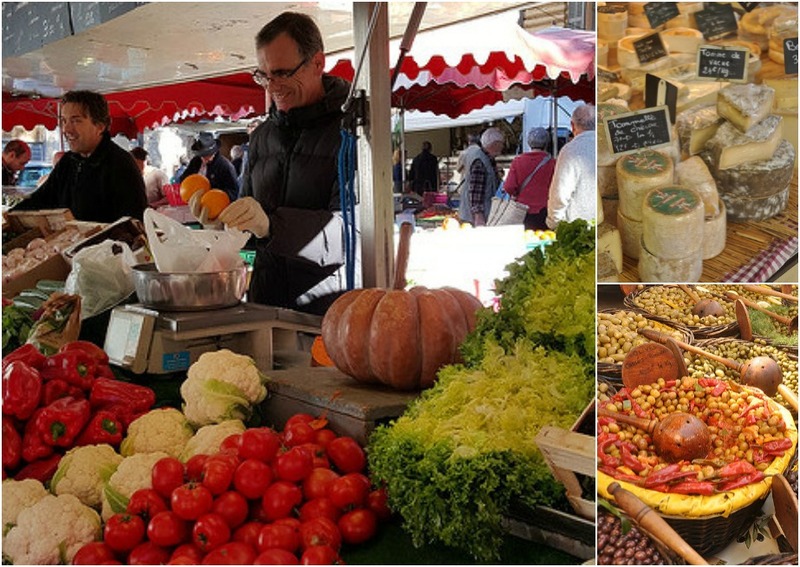 Get expert tips for shopping the Aix-en-Provece market and any market in Provence. Includes: Three-hour market tour with tastings. You’ll have at least 8 tastings, including breakfast pastries, various local & seasonal produce, typical food products like olives, tapenade and jams. At the end of the tour, receive Kathy’s Food Lover’s in Provence guide that includes some of her favorite Provencal recipes, food shops and restaurants. Chef Kathy takes you on a food tour of Aix-en-Provence. You’ll start with a breakfast pastry at the oldest pastry shop in Aix and end with a fun seated wine tasting that includes a typical Provencal apero buffet of delicacies from the day’s walk. In between, Kathy will take you on a guided tour of the 700-year-old daily market in Aix and to specialty food shops. You’ll meet and talk with local food artisans, learn about their products and taste their products. The afternoon will end with the group seated at our beautiful dining table sampling a light lunch buffet from the day’s walk and two Provencal wines. You’ll also receive Kathy’s Food Lover’s Guide to Provence that includes some of her favorite Provencal recipes, favorite food spots and restaurants in Aix and throughout the region. Includes: Two-and-a-half-hour market and food tour with tastings of breakfast pastries, various local & seasonal produce, typical food products like olives, tapenade and jams. At the end of the tour, you’ll have a seated wine tasting of two Provencal wines and a buffet sampling of foods from our walk that will include: charcuterie, cheese, breads, seasonal fruits and French pastries. At the end of the walking tour, receive Kathy’s Food Lover’s in Provence guide that includes some of her favorite Provencal recipes, food shops and restaurants.